The G7 X Mark II is the standout "G-X" series camera. It puts the slender G9 X to bed, is more pocketable than the G5 X and others in the range, without compromising on the performance front. Where are the next-level autofocus features? Canon was late to the 1-inch sensor compact cameras game, following in the Sony's RX100 footsteps to deliver the original PowerShot G7 X back in 2014. In the period since then this larger-than-average sensor sector has become a battleground. Nobody wants to invest in paltry small sensors when smartphones are delivering considerable quality that, often, can match. The PowerShot G7 X Mark II is a nip-and-tuck version of the original; it slots into the Canon PowerShot line-up alongside plenty of other "G-X" models - the slim G9 X, chunkier and viewfinder-featured G5 X - and, for us, is one of the most logical models of the bunch. After all, the G7 X is pocketable and has got that 24-100mm f/1.8-2.8 equivalent lens rather than anything with a more limited maximum aperture range. The G7 X Mark II doesn't change that core feature set much. The lens is the same, as are its customisable controls, and the 20.2-megapixel sensor at its core (albeit with a new processor, the Digic 7, a first for Canon's compacts). What it does noticeably ramp up, however, is its overall speed in use. 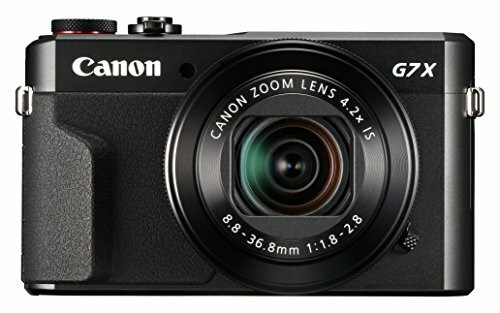 With Sony holding onto its king-of-the-compacts crown with the RX100 IV, big names like Nikon making headway in the category with its new DL models, and established makers like Panasonic delivering a variety of accomplished compacts (the Lumix LX100, for example), is Canon merely treading water with the G7 X II or making notable progress? For a long time we've criticised Canon high-end compacts for lacking truly high-end responsiveness. But the first thing that strikes about the G7 X II is just how rapid it is: it's twice as fast to start-up, for example, meaning you can shoot near instantaneously. But beyond that nicety its shutter button is considerably more responsive - if you've used a pro DSLR you'll have an idea of how even a gentle depression will cause a reaction - paired with rapid autofocus for speedy capture. Which sets the G7 X II up in good stead, because we fully anticipated it would feel like using the 2014 original, albeit with a slightly chunkier grip. That's one of the new physical design traits of the Mark II, but other than a new lens control ring adjustment switch, that's about all: otherwise the same multi-dial, reasonably trim and pocketable design remains in tact. Meaning, of course, that there's still no viewfinder allocation, nor provision to add one. Arguably that doesn't matter because the G5 X exists to cover that feature, but looking outward to, say, the Sony RX100 IV and its smaller build plus built-in viewfinder shows what's possible. So Canon isn't ahead of the curve by design. However, the G7 X II is still accomplished. Its really well built, all 319g of its metal construct feeling solid in the hand. The rear LCD screen moves deftly from its standard position through any angle to 180-degrees to face forward, plus, unlike with the original model, it can also face 45-degrees downward. We've used the camera with its screen facing 90-degrees upright a lot, making waist-level and discreet capture all the more possible. The layout and physical controls are a big part of what sells the G7 X II: a dual dial stack covers the shooting modes and dedicated exposure compensation; a rotational d-pad to the rear is there to cycle through settings; while, perhaps most important of all, is a lens control ring to the front for quick operation of the key setting (depending on selected shooting mode), which now includes that adjustment switch to toggle between click-stops and smooth rotation depending on what you prefer. As with its predecessor, it's worth highlighting just how much can be customised with the lens control ring, using the Ring Func button to make adjustments. From default - i.e. in aperture priority mode the ring adjusts aperture, in shutter priority it adjusts shutter speed, and so forth - through to ISO, manual focus, white balance, step zoom, shadow/DR correction, aspect ratio and even C for custom settings. We've already alluded to how much quicker the G7 X II is than the original, but despite this it still holds back in terms of performance features, especially considering the wider context of cameras available on the market. For example, the Panasonic Lumix LX100 adopts that company's higher-spec autofocus and menu settings as drawn from its compact system camera line - a criticism we raised two years ago with the original G7 X - including pinpoint autofocus and other options. The G7 X II keeps things altogether simpler, yet successful. There's the simplistic option of 1-point AF with small/normal focus area sizes, or face detection priority, which make up the breadth of its AF options. The 1-point option is quick to respond, though, especially when using the touchscreen to easily move the focus area. We've been using the camera in and around Kent and while travelling through Shanghai, where it's proven most effective because of its size. We're not worried about taking it out at night, for example, because it slips into a pocket. Can't say that of the Sony Cyber-shot RX1R II, which we're also testing alongside. Whereas with the original G7 X we were left wanting that little something extra, with the Mark II model the speed and responsiveness feels ample. Although Sony does a grand job with its feature set, the addition of touchscreen controls in the Canon makes it a breeze to use. However, capturing moving subjects with the G7 X II is tricky, while close-up focus seems stunted this time around as, for some reason, it's possible to manually focus closer than autofocus in macro mode will permit. However, persist and the close focus - 5cm from the protruded lens at the 24mm equivalent, dropping to 40cm when extended to the 100mm equivalent - can bring decent results thanks to that wide aperture delivering a soft background. Having improved its Wi-Fi offering in the last few years, the G7 X II also benefits from Canon's remote sharing and remote control features. Simply download the Canon Camera Window application (iOS / Android only) to your phone or tablet and, assuming you have a network (unlike in China, of course), it works very well; that touchscreen benefits keying in entries quickly too. Last up there's battery life, which is entirely reminiscent of the original G7 X. The NB-13L cell (which has a 1250mAh capacity) lasts out for a few hundred shots, but that's it. The "three bar" display of battery life doesn't relay how much juice remains with particular accuracy either. A key reason to spend the money on a high-end compact comes down to its sensor. In the case of the G7 X II it's a familiar 1-inch 20.2-megapixel slice of silicon - rumoured to be the same as in the RX100 IV - which is far larger than you'll find in lesser cameras and similar-price smartphones. The extra size promises extra quality and the ability to pull off a more professional aesthetics, such as the enhanced shallow depth of field (think blurred background with an in-focus foreground subject). Now Canon says the Mark II's sensor ought to perform better than the original model by a whole stop (so ISO 1600 in the new model should look like ISO 800 on the old model) thanks to the introduction of its Digic 7 processor. With sensors rapidly peaking at their maximum ability, it's interesting to see how much refinement is being achieved courtesy of the processor. However, we're still not quite blown away by the G7 X II's high-ISO low-light capability. It's not quite RX100-matching in the range of ISO 1600-6400, as there's a visible level of grain and the finer details certainly go amiss when viewing at 100 per cent scale. One issue with the Canon comes down to its lens though: "haloing" around subject edges if using close-up focus is pronounced with wider apertures. Wind down the sensitivity scale, however, and the overall image quality performance is solid. The lowest ISO 125 option maintains crispness to subjects, as shown by a dust-bathing pigeon in the park, while clarity remains through to ISO 400/800, as shown by rabbit statuettes and apples at a mini market (check out the gallery for full range of images). One of the other big sells for the G7 X II is that wide aperture lens, which is usable wide-open in just about all conditions thanks to an on-board ND (neutral density) filter. This pushes a filter into the lens path if you opt to use a wide-open aperture setting in bright conditions, to avoid overexposure. Oh, and if you're interested: the G7 X II's f/2.8 aperture is forced into play from the 60mm equivalent and beyond; it's f/2 at 28mm, f/2.2 at 35mm, and f/2.5 at 43mm equivalents. Far better than the G9 X's maximum aperture woes. We've not got to use the widest-angle wide-open setting all too much, therefore, except for when unusual circumstances called for it (a dog created from pegs, anyone?). Overall the G7 X II does a good job in the image quality department, despite limitations to high ISO performance. Its lens offers almost enough to take on the Sony RX100 IV, but critically at a lower price that will entice (the Mark II model is actually a little less than the G7 X original was at launch). The Canon PowerShot G7 X Mark II has impressed us more than we had anticipated. Its scale and feature set might not be class-leading, but what looks like little more than a nip and tuck compared to the original model turns out to be a turbocharging in the performance stakes. Considering how pricey the Sony RX100 III/IV cameras are, the G7 X II certainly earns its place in among the 1-inch sensor rankings. However, there's still no viewfinder, the image quality can't quite better the Sony RX line-up (at higher ISO settings anyway), and close-up focus has some qualms - but all those minus points work out as plus points in your wallet. The Canon's biggest problem, perhaps, is just how strong the large-sensor compacts market has become. With Nikon's DL newbies on the horizon, Panasonic busting out the LX100 (which has an even larger Micro Four Thirds sensor; albeit with a so-so lens pairing), and Fujifilm retaining the retro king crown in its X-series line-up, the G7 X Mark II lays down a strong show, just not one that's full-marks enough to fully distract from its competition. At its best, however, the G7 X Mark II is the standout "G-X" series camera. It puts the slender G9 X to bed, is more pocketable than the G5 X and others in the range, without compromising on the performance front. Think about it this way: the G7 X II takes what was the best G-series camera for a number of years and betters it.